The 2011 Subaru Impreza WRX and WRX STI are fast, fun cars to drive in any situation, and they're comfortable, safe, and practical enough for small-family use; poor fuel economy and a lack of automatic transmissions limit its appeal, though. Subaru has a knack for continuous improvement on its vehicles—particularly its performance-minded Impreza WRX and STI models. And while these rally-themed models aren't all-new this year, both of them get a more aggressive look as well as extensive changes underneath. Line both of these models up side by side and they're closer than ever in appearance. Together, both of these models get a number of changes—most of which are now shared between the WRX and the STI. A new wide-body brings macho front-end detailing, an aggressive lower-body look, quad-tip exhausts, and bulging front and rear fenders that give the car more voluptuousness. Inside, the appearance is familiar, but there are new instrument clusters, a new audio system, and darker, more understated trim. At first look, the 2011 Subaru WRX has shed some of the bland appearance for which it's been criticized since the entire Impreza family was last redesigned. Both models remain offered in four-door sedan or five-door hatch bodystyles, but it's the sedan that's changed (and benefited) most from the new wide-fendered look. Where it looked a little dowdy before, the flared sheetmetal makes the whole design pop. In our opinion, the hatch was already the better of the two bodystyles, and it also benefits a bit from the new look. The WRX and STI are both based on Subaru's Impreza compacts. But for 2011, the WRX is now more differentiated from the Impreza; it now shares its body structure with the STI, but powertrain and suspension is where they're quite different, and it amounts to a quite different driving experience between models. The 2011 WRX continues to get a 265-horsepower, 2.5-liter horizontally opposed (boxer) four-cylinder engine and five-speed manual transmission, with viscous-differential all-wheel drive, while the STI gets a 305-horsepower, 2.5-liter turbocharged boxer four, six-speed manual transmission and an all-wheel-drive system that includes the Driver-Controlled Center Differential (DCCD). Worth noting is that the former Impreza GT model with the four-speed automatic has been dropped. That leaves an all-manual lineup for the WRX and STI, a factor that might be a deal-breaker for some. While these two engines are now relatively close in output, their tuning is quite different. The STI works itself to a frenzy near redline but can be gruff and flat-feeling down low; the WRX, by comparison, comes on smoother, torquier, in a way you can feel a full 1,000 rpm lower. The combination of slightly larger gaps between gears makes it feel more docile, more flexible, though ultimately less aggressive; only serious enthusiasts are going to keep the STI revving and keep its awe-striking quickness on tap. Only in the STI, an SI-Drive controller lets you select Intelligent (I), Sport (S), or Sport Sharp (S#) modes, each affecting throttle response. There's an Auto, Auto+, Auto-, and six levels of manual center-diff lockup, all accessed through a little flip switch in the center console. Larger Brembo performance brakes are included with the STI as well, and a Super Sport ABS system allows independent control of each rear wheel and reduces understeer. And the stability control system includes a 'traction' mode, intended for the track, that uses the brakes but no longer cuts the throttle; it can also be turned off completely. With some clever suspension engineering, Subaru has managed to stiffen springs, bushings, and stabilizer bars, and lower ride height on the STI this year, without making the in-cabin experience any harsher. The 2011 WRX keeps it simpler—and, some might say, more enjoyable—skipping the DCCD, SI-Drive, and trick new front suspension. Pick the right gear coming into a corner and the WRX will slingshot you out of it, scrabbling for more grip than you knew was there. Blip the throttle while braking—the pedals are well-spaced, even for big feet—and drop a gear or two, trailing off the brake as you turn in, and there's no understeer, no tendency to push when it should grip. Do it right and you can even induce a little four-wheel slide just about anywhere you'd like, perfectly controlled and very neutral. With any sports car, the engine is only part of the story, and this is especially true in the case of the WRX and STI. Subaru engineers have done a sublime job with the suspension tuning. Despite thicker anti-roll bars and stiffer springs being introduced last year, both the WRX and STI soak up bumps, ruts, potholes, and coarse surfaces with aplomb. The ride is beautifully smooth and isolated; the handling wonderfully direct and taut. At highway speeds, apart from a little engine rumble and wind noise from the side mirrors, the cabin is very quiet. Slide behind the steering wheel of either the WRX or STI and you're greeted by a well-lit instrument cluster that's dominated by a large, centrally mounted tachometer. It's flanked on the right by a smaller speedo in Porsche fashion, and all the gauges are clearly marked and readable in an instant—gone are the tacky boy-racer and econo car designs of past generations. A pair of racing-style bucket seats is positioned up front, and while they are incredibly supportive, we did have some qualms. Namely, the seats come with a fixed headrest (the entire seatback is just one long piece) that some testers find uncomfortable. Note that STI model gets more upmarket Alcantara trim, and for 2010, black Alcantara with red stitching replaces last year's gray and silver stitching. The rear compartment is happily much bigger than the car's tidy exterior dimensions suggest. Headroom in back, a sore spot for most small and even mid-size cars, is fantastic even for those unusually long in the torso. Trunk space is reasonable at 11.3 cubic feet, and fold-down functionality for both sides adds a world of convenience. For both style and practicality, we think the hatchback's the way to go. One issue in the STI especially is that it throws up a bit more road noise and a rather jittery ride. The 2011 Impreza WRX and STI are two of the safest vehicles in their class, with five stars from NHTSA in most categories and good ratings—at least last year—from the IIHS. All Impreza variants come with side impact and side curtain airbags, electronic stability and traction control, anti-lock brakes with brake-force distribution and brake assist, and daytime running lamps as standard. Manual models also get hill start assist. Once upon a time getting an STI meant getting a very basic tuner-car interior with limited options, but you'll no longer need to make that compromise. Subaru has become smart to the idea that WRX buyers would rather have a STI, and some STI buyers aspire to a BMW M3 or Porsche Cayman—without giving up creature comforts—so the automaker has now added an all-weather package for the STI, as well as made leather and a moonroof optional. Sound systems are all-new this year, with standard USB and iPod connectors, while a touch-screen nav system with Sirius Satellite Radio remains optional. And Subaru has finally added a one-touch up/down driver's window with anti-pinch. Of course all of this places the WRX and STI on stronger competitive ground against its archrival, the Mitsubishi Lancer Ralliart and Evolution. While the styling of the 2010 Subaru Impreza WRX’s and STI’s exterior won’t be to everyone’s tastes, the interior will certainly leave a good impression on most palates. Subaru has a knack for continuous improvement on its vehicles—particularly its performance-minded Impreza WRX and STI models. And while it rolled out an all-new sporty Impreza WRX and high-performance STI for 2008, it gave the WRX a host of mechanical upgrades for 2009, with a few more tweaks last year. Now, for 2011, both of these rally-themed models get a more aggressive look, but it's the top STI that gets the most performance innovation this time. First, the look: Line both of these models up side by side and they're closer than ever in appearance. Together, both of these models get a number of changes—most of which are now shared between the WRX and the STI. The new wide-body look brings a new grille, a new 17-inch alloy wheel design with wider tires, and a WRX spoiler for the sedan. Up in front, the lower air intake is wider and lower, the lip spoiler is resculpted, and blacked-out foglamp bezels further help the wide, low look. In back, both models get a more aggressive lower-body look with quad-tip exhausts, and of course alongside the front and rear fenders now bulge outward, giving the car more voluptuousness. Inside, the appearance is familiar, but there are new instrument clusters, a new audio system, and darker, more understated trim. 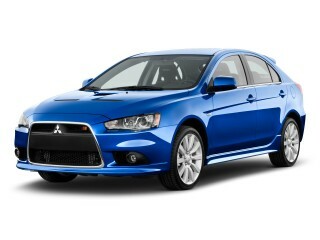 Both models remain offered in four-door sedan or five-door hatch bodystyles. But arguably, contrary to what we suspected in pictures, it's the sedan that benefits the most from the new wide-fendered look. From rear three-quarter angles in person, where the sedan has looked a bit dowdy and awkward since its redesign, the flared sheetmetal makes the whole design pop. The sedan also gets a more aggressive spoiler configuration that helps improve aerodynamics and raise top speed (to 158 mph for the STI). In our opinion, the hatch was already the better of the two bodystyles, and it also benefits a bit from the new look. The styling of Subaru's cars has always been very distinct, and the exterior of the 2010 Subaru Impreza WRX and STI is just as polarizing as anything else in Subaru's past. However, TheCarConnection.com's research shows that the interior of the Subaru Impreza WRX and STI, which was redesigned in 2008, is loved by most. The 2010 Subaru Impreza WRX is available in either sedan or hatchback body styles, while the high-performance Subaru Impreza WRX STI comes exclusively as a hatchback. Reviews of the sedan are average, as Edmunds finds, reporting that "from the rear doors back, the styling screams econobox, with homely taillights" and a wealth of uninspiring trim elements. 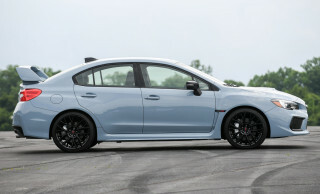 The hatchback, on the other hand, is a different story; Jalopnik's testers say that the STI model "isn't what you'd call traditionally handsome," but they praise its "air of purposeful muscularity," which is enhanced by the "wildly flared arches, huge hood scoop and restrained rear wing." In a nod to the unorthodox design, Car and Driver notes that the Subaru Impreza WRX and STI feature "love-it-or-hate-it styling." Jalopnik, meanwhile, laments that "the controversial looks will keep it from mass-market acceptance." The 2010 Subaru Impreza WRX and STI feature one tiny styling change for the latest model year: the addition of a newly designed side sill. Step inside the 2010 Subaru Impreza WRX or STI and you'll be forgiven for thinking it was designed by a completely different company. It's a huge improvement over the rather Spartan interior that characterized previous versions of the Impreza. Jalopnik describes the "swoopy and odd" interior as "positively refreshing," while Edmunds raves that the "legible gauges remained so in practically any lighting situation, with a simple layout centering the large tachometer prominently behind the steering wheel." For buyers eyeing the 2010 Subaru Impreza WRX equipped with the optional navigation system, ConsumerGuide notes that "the navigation system itself is easy to negotiate," something rare in this segment. The 2011 Subaru Impreza WRX and STI handle everything thrown at it with a willingness you won't find even in some purebred sportscars. Even before looking at what the STI's extra toolkit does, there remains quite a difference between these two models, just in the way they respond to your right foot—even in how they sound. Start the STI up and take off gently and the engine sound is deep and pulsating, with more of a tuner note; the WRX sounds more like a 'normal' car. Indeed, these two models have very different tuning, and the uninitiated might think, at first impression, that the WRX has the stronger engine. It's a little deceiving that both engines are listed as producing their peak torque at 4,000 rpm, and the STI produces a peak boost of 14.7 psi, versus 14.2 psi, but the STI's engine saves it all for the upper ranges. Shift a little too early and the STI feels almost sluggish, but keep the revs up and somewhere north of 3,500 rpm it'll suddenly pin you back in your seat. Fortunately, the six-speed manual has closely spaced gears, and once you're on top of that peak boost you can keep it close. The WRX, by comparison, comes on smoother, torquier, in a way you can feel a full 1,000 rpm lower; and the combination of slightly larger gaps between gears makes it feel more docile, more flexible, though ultimately less aggressive. Only in the STI, an SI-Drive controller lets you select Intelligent (I), Sport (S), or Sport Sharp (S#) modes, each affecting throttle response. Larger Brembo performance brakes are included with the STI as well, and a Super Sport ABS system allows independent control of each rear wheel and reduces understeer. And the stability control system includes a 'traction' mode, intended for the track, that uses the brakes but no longer cuts the throttle; it can also be turned off completely. There's a real difference in the way the WRX and STI ride and handle, too. While the STI's setup feels tight and well controlled in almost every case, and the WRX continued to surprise us with its poise, the WRX has a little more bounciness, a little more lift and squat during extreme maneuvers. Both models, by the way, benefit from an inch more of rear track, and the WRX has stiffer rear bushings and new, lighter 17x8 Hitachi wheels. While the WRX's suspension layout has been mostly carried through, there are some major changes in the STI's suspension. With some clever engineering, Subaru has managed to stiffen springs, bushings, and stabilizer bars, and lower ride height, without making the in-cabin experience any harsher. The key to this is a new pillow-ball bushing setup—at steering pivot points—that essentially helps isolate road harshness while preserving the responsive, communicative feel just at turn-in (and preserving the geometry off-center) that would lead to more driver confidence. It's a solution borrowed from racing cars that, in the STI, is the perfect solution, and Subaru says it provides more stiffness on the track and reduces understeer in cornering. What it all means, based on our driving experiences on-road and on-track, it that Subaru has been able to tune the suspension to be stiffer and lower while keeping the steering feel just right; it gives enough road feel yet doesn't kick hard. The STI's willing partner is the DCCD system, which sends 41 percent of torque to the front wheels and 59 percent to the rears. There's an Auto, Auto+, Auto-, and six levels of manual center-diff lockup, all accessed through a little flip switch in the center console. Though we drove on the road for most of the time in the Auto mode, on the track we were able to get that rotation, and feel the tiny bit of power oversteer, in Auto- and the Traction mode. Materials could use some improvement, but you won't be constantly punished for the performance capabilities of the 2011 Subaru Impreza WRX and WRX STI; they have a comfortable ride and roomy interior. Both the sedan and hatchback versions of the 2011 Subaru Impreza WRX and STI (they're both now available in either style) offer seating for five, though larger adults may find long trips a bit of a struggle. Room in the back seat is better than you'd expect, with plenty of room for sub-six-footers. Taller adults will prefer the front seat, and since it's a performance car, the WRX and STI include quite supportive well-bolstered seats; the Alcantara-surfaced Recaros are the superior pick, though you should make sure you're alright with the placement of the fixed headrest. With the hatchback a bit shorter than the sedan, cargo space isn't abundant in either case—and the sedan's trunk isn't quite as useful as you might think because of a trunk floor that's uneven and sloped. Slide behind the steering wheel of either the WRX or STI and you're greeted by a well-lit instrument cluster that's dominated by a large, centrally mounted tachometer. It's flanked on the right by a smaller speedo in Porsche fashion, and all the gauges are clearly marked and readable in an instant—gone are the tacky boy-racer and econo car designs of past generations. A pair of racing-style bucket seats is positioned up front, and while they are incredibly supportive, we did have some qualms. Namely, the seats come with a fixed headrest (the entire seatback is just one long piece) that some testers find uncomfortable. Despite thick anti-roll bars and stiffer springs, both the WRX and STI soak up bumps, ruts, potholes, and coarse surfaces with aplomb. The ride is beautifully smooth and isolated; the handling is wonderfully direct and taut. At highway speeds, apart from a little engine rumble and wind noise from the side mirrors, things are very quiet in the cabin. The STI has a noticeably louder (lower, pulsating) exhaust note on startup that racer-types will love—and you'll notice it when driving hard—but in cruising it's never obtrusive. While some of the newest crash-test ratings are missing, the 2011 Subaru Impreza WRX and STI are packed with the latest safety gear and should be better than most at avoiding an accident in the first place. The 2011 Subaru Impreza WRX and STI are no longer structurally different from each other; for 2011 the WRX shares its lighter, more rigid structure—which includes some different body panels and significantly bolstered underpinnings—with the STI, rather than the Impreza and Impreza Outback Sport. It would probably be safe to assume that this slightly different structure is safer, but the Insurance Institute for Highway Safety now separates the two series of models and hasn't yet tested the WRX family. The IIHS gives the 2011 Subaru Impreza top 'good' ratings for frontal offset, side impact, and roof strength, and it earns the Top Safety Pick designation, but the IIHS notes that those ratings do not extend to these performance models—presumably because there are now enough structural differences between the models. Although the 2011 Subaru Impreza WRX and STI haven't yet been rated by the federal government, according to its heavily revised 2011-model-year crash-test system, the previous 2010 models carried five-star frontal ratings and four- and five-star side-impact ratings. 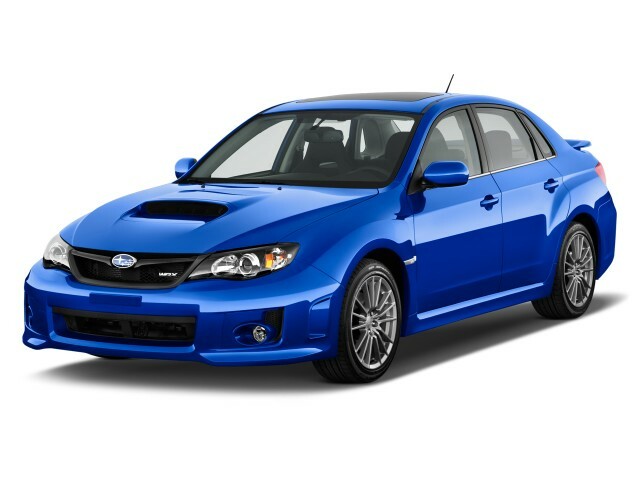 The 2011 Impreza WRX and STI models have a number of additional features and attributes that make it a very safe choice. All Impreza variants come with side impact and side curtain airbags, electronic stability and traction control, anti-lock brakes with brake-force distribution and brake assist, and daytime running lamps as standard. Manual models also get hill start assist. And finally, as with any Subaru model, standard all-wheel drive proves invaluable during inclement weather. The 2011 Subaru WRX family no longer has a tuner-car feel inside; these are well-equipped touring cars with no shortage of tech and entertainment features. Once upon a time getting an STI meant getting a very basic tuner-car interior with limited options, but you'll no longer need to make that compromise. Subaru has become smart to the idea that WRX buyers would rather have a STI, and some STI buyers aspire to a BMW M3 or Porsche Cayman—without giving up creature comforts—so the automaker has now added an all-weather package for the STI, as well as made leather and a moonroof optional. A touch-screen nav system with Sirius Satellite Radio remains optional. And Subaru has finally added a one-touch up/down driver's window with anti-pinch. Of course all of this places the WRX and STI on stronger competitive ground against its archrival, the Mitsubishi Lancer Ralliart and Evolution. Despite new sound systems for 2011, we still aren't that fond of the interface or the sound quality in the WRX and STI models, though they now include Bluetooth connectivity—both for hands-free calling and music streaming—as well as an auxiliary input, USB, and iPod connector. Otherwise, it's easy to forget when out on the track that these are very practical, useful vehicles; with a good set of all-weather tires, they're great in the snow, they don't have the delicate groundwork of other performance cars, and back seats fold down easily for more cargo. The real standout feature of the 2011 Subaru WRX isn't any one feature at all—it's the way Subaru has managed to package so many very good features into an affordable package. Priced at $28,995 for the Limited model, which is very nicely configured as it sits, the 2011 WRX delivers on all fronts. With mileage worse than many larger six-cylinder sport sedans, the 2011 Subaru WRX and STI just aren't very green. Fuel economy is a real disappointment in the 2011 Subaru WRX and STI—especially in a year when the V-6 Ford Mustang is rated above 30 mpg—and it's why these racy little cars just aren't that green. The EPA fuel economy rating for the WRX is 19 mpg city, 25 highway, with its sole five-speed manual gearbox, while the STI gets a 17/23 rating with its six-speed. And based on several daily-driving experiences with both of these models, you'll be hard pressed to hit 25 mpg on a highway cruise in either the WRX or the STI, while around-town figures will stay in the teens. Great Car, good MPG for the type of car. I've owned this vehicle for a little over 4 years now. Car performs like a champ, always has. As with all Subaru vehicles, it is amazing in the snow. Handling and performance are amazing for the cost. Someone... I've owned this vehicle for a little over 4 years now. Car performs like a champ, always has. As with all Subaru vehicles, it is amazing in the snow. Handling and performance are amazing for the cost.